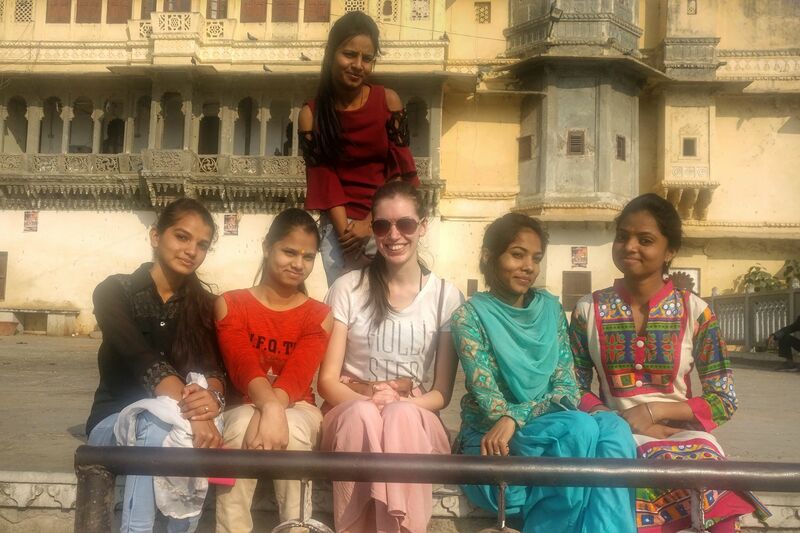 Last week, I talked about our time in Agra and our visit to the Taj Mahal. 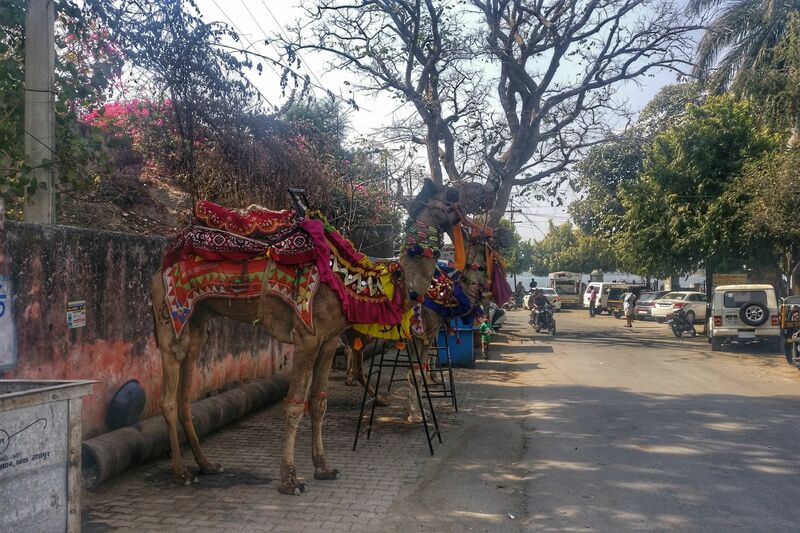 In this post we head west to Udaipur, in the desert state of Rajasthan. 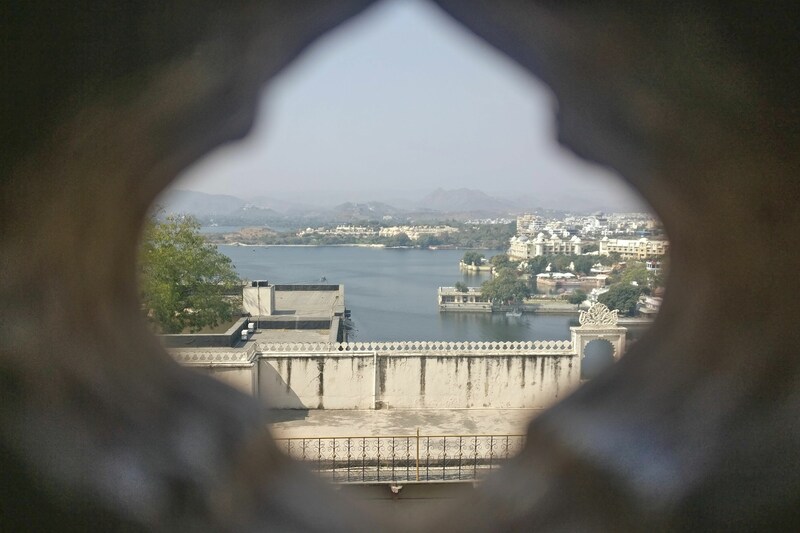 Udaipur is a must visit if you travel to India. It is sometimes called the “White City” because of the colour of the buildings in the old city. It s also known as the “City of Lakes” because of its several artificial lakes. I’ve seen it called the “Venice of the East” because of these lakes, but this title seems to be used for any city with a bit of water. We spent a total of four days here, and in that short period we fell in love with the charming aura of this old city. 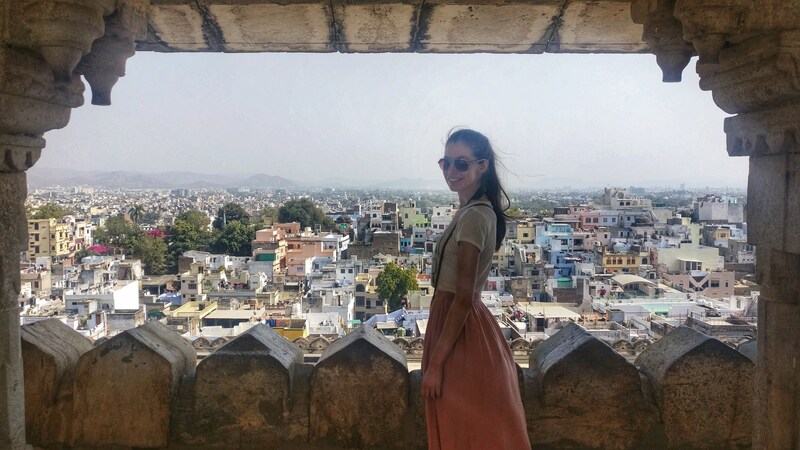 The people, mouth watering food, narrow winding streets, picturesque lakes, the beautiful palaces and temples all created a special atmosphere like nowhere else in India (that we visited). If you are staying in the old city (which you should) you can reach most places by foot pretty easily. As confusing and unplanned as the streets seemed we never managed to get lost. 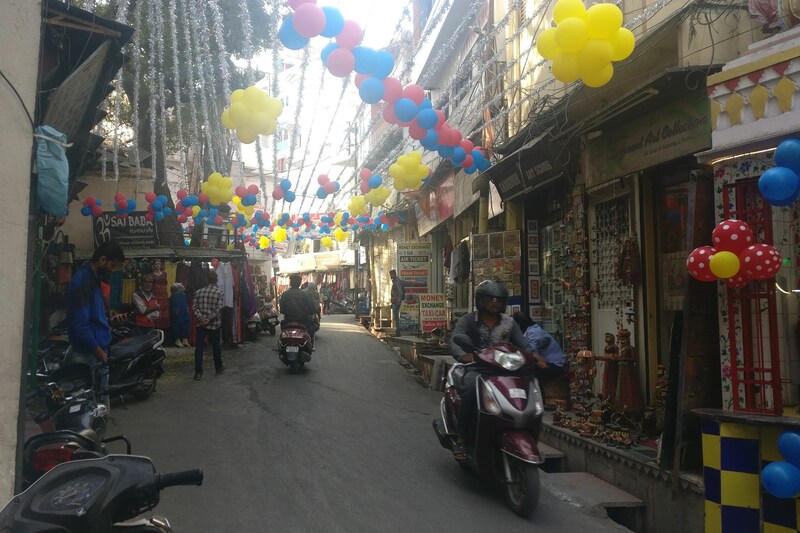 Most streets are pedestrian friendly, helped by the fact that they are narrow; rendering them unsuitable to anything other than people, bikes and cows. Most activities and sights of interest are located in and around the old city. If you need to go further afield to the new city or if you’re just tired of walking around you can easily find a tuk tuk. 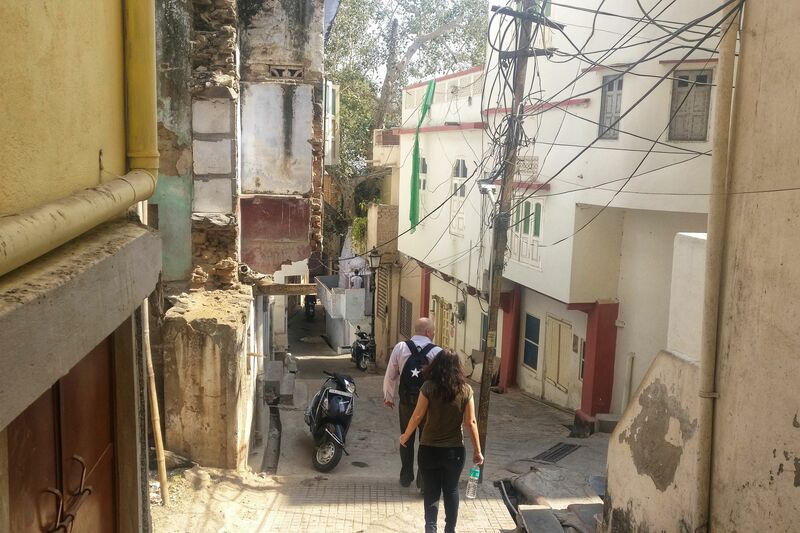 We walked nearly everywhere in Udaipur. Most streets and alleys have something interesting that make them worth walking down. 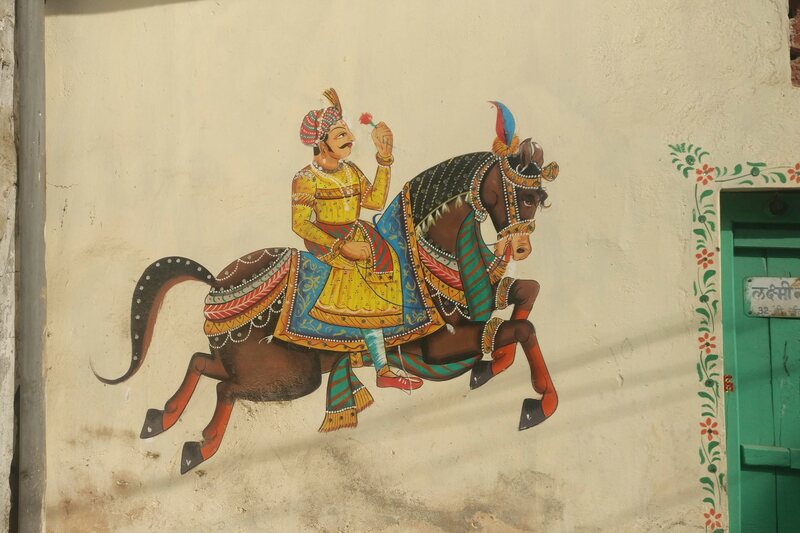 Many have some form of street art; styles varied from your typical modern street “graffiti” to some traditional Rajput-style murals like in the picture below. 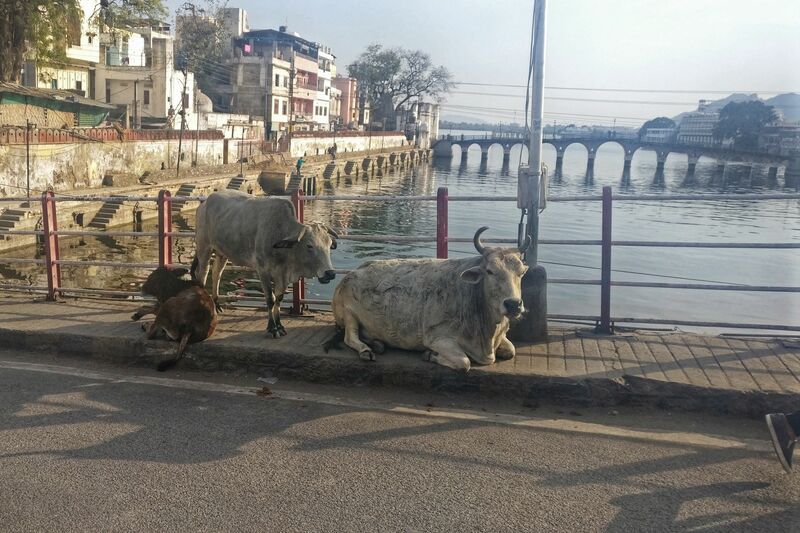 Other than that you will see animals chilling in the sun or street vendors plying their trade throughout the day. 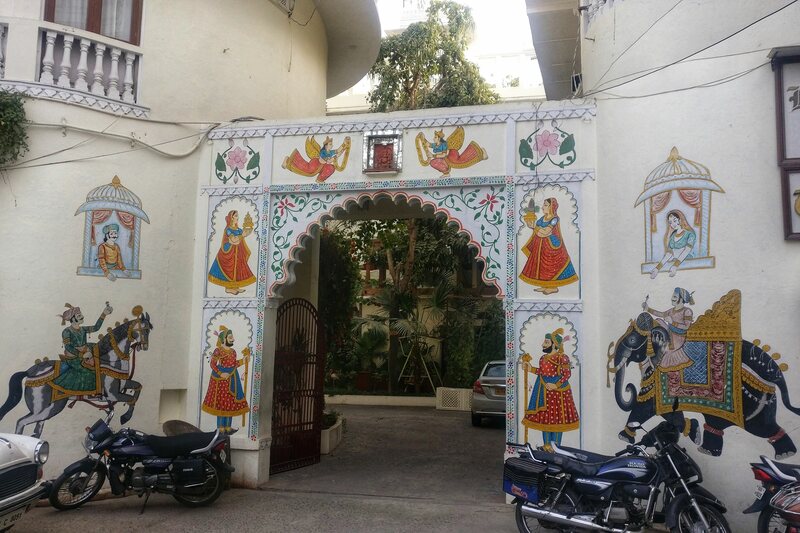 We stayed in a guesthouse called Mewargarh Palace for our three nights in Udaipur. We got a private ensuite bedroom for Rs 700 (€8.84)/night. Bargain! And no, we didn’t have to compromise on quality for that price. This was one of the nicest places we stayed in during this trip! It was clean, comfortable, the owners were really friendly and the rooftop restaurant served good food with a view. However, there were two downsides to staying here. We both were woken up a few times every night because of dogs in the area barking constantly. There is also a mosque nearby and they like to convene for their daily prayers at dawn, which meant that we were awake very early every day. Both of these downsides were not the fault of the guesthouse and you should kind of expect noises like this if you’re staying in a city. So yes, I would definitely recommend staying here… just be to sure to bring a good pair of earplugs 👍. Entry: Rs 500. Don’t worry, if you want to just visit the grounds of the City Palace it’s free. 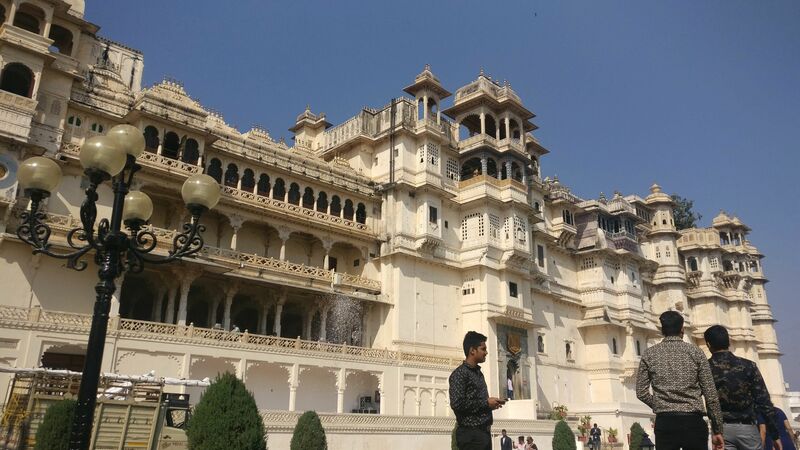 Go inside however and you will get the chance to witness where the Mewar dynasty ruled from for 400 years and see how they lived. Entry: free. This large Hindu temple located in the heart of the old city has been host to continuous worship since 1651. 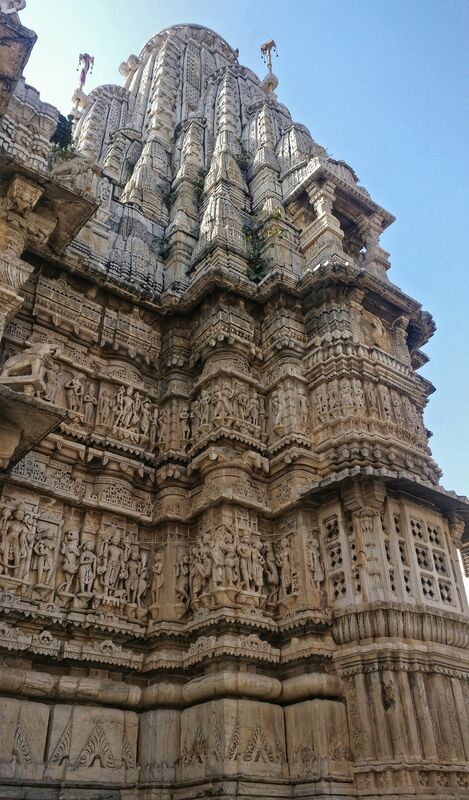 Its grey stone surface, which peaks at 24 metres, is covered with intricate Hindu carvings and is supported by many beautifully carved pillars. When we were here there was catchy religious music and song coming from inside, which we stayed to watch and enjoy for a few minutes. Entry: free. 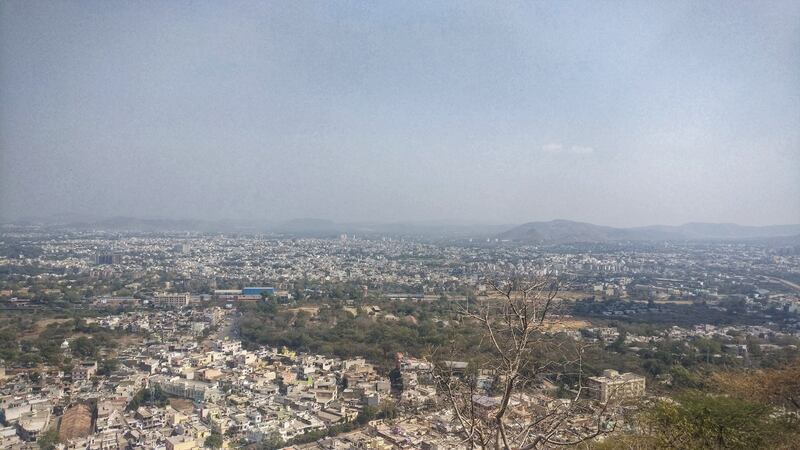 You can climb it for free, but we had already done a lot of walking this day so decided to pay Rs 300 each to take a cable car to the top of Machhala Hill, home to the renowned Karni Mata Temple. 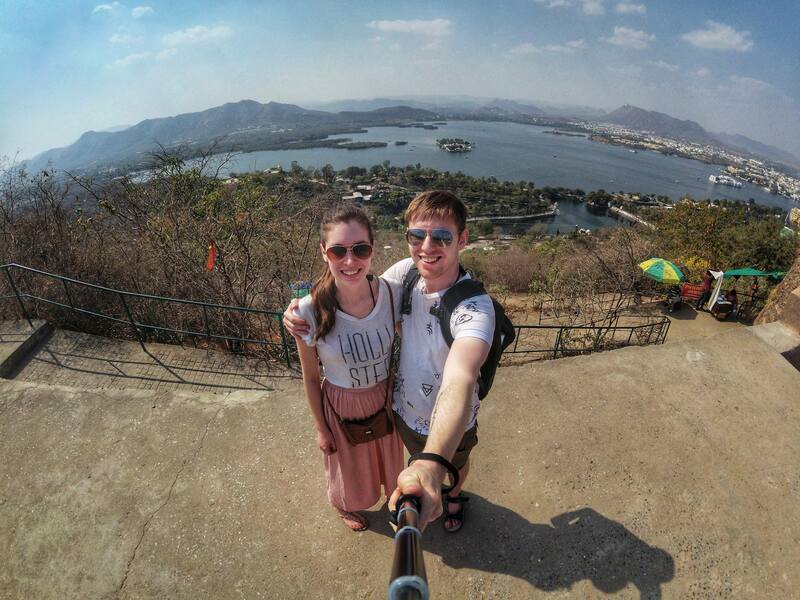 We didn’t visit the temple but did come for the spectacular views of Udaipur and its many lakes. We came during the day but I can imagine that the view would be particularly special at sunset. Entry: free. This is a nice place to spend some time in the evening. Just sit on the steps leading down to the water and watch the boats go by or the people coming to socialise after their long day at work or school. Entry: Rs 150. If you want to get a glimpse of Rajasthani heritage this show is for you. 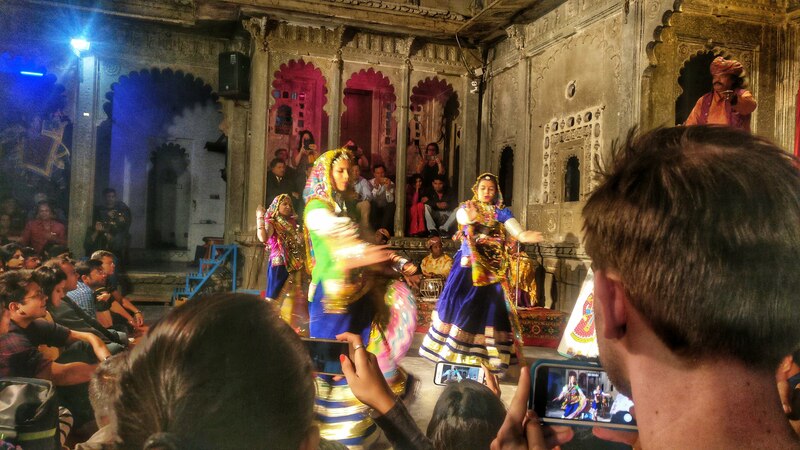 Hosted in Bagore-ki-Haveli, the performance itself is a rich myriad of folk dances, music, bright colours and a puppet show, which lasts about one hour. This is an extremely popular show which we really enjoyed and tickets usually sell out, so it’s advised to get there eary to avoid disappointment. 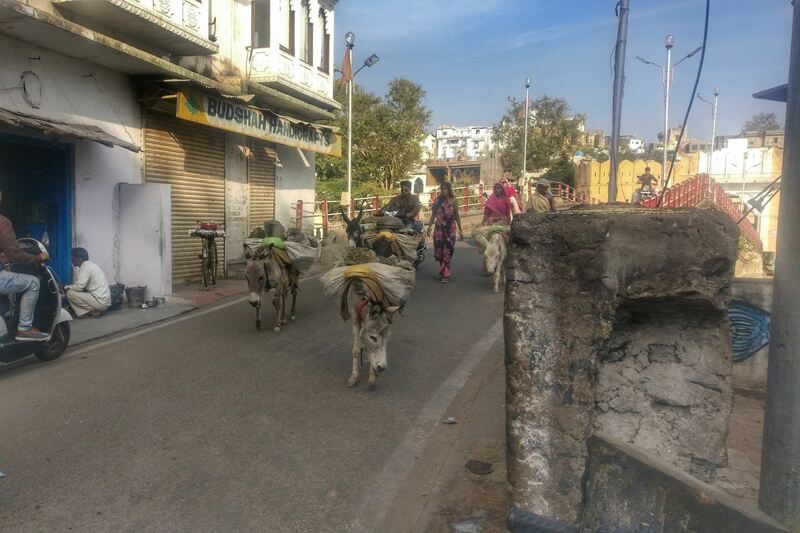 We were sad to leave Udaipur, but after four days here it was time to move on. Next we travel to Mumbai, India’s largest city. 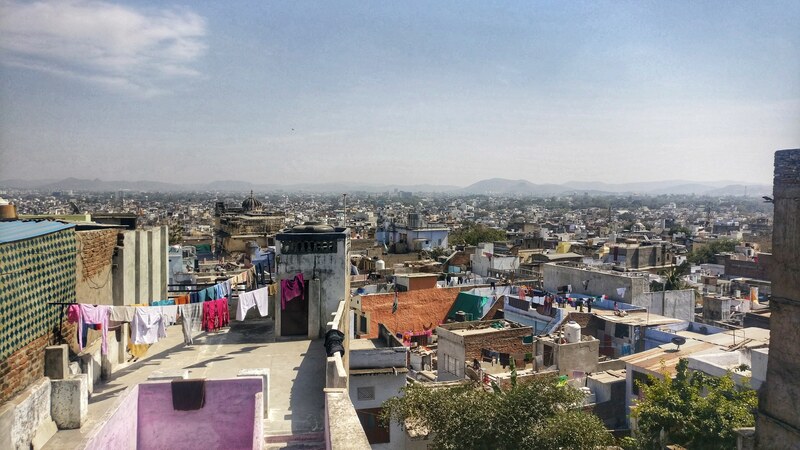 Home to the world’s most expensive home, the largest slum in Asia and Bollywood; this is a city of extremes.